Your travel guide for the Himalayas! The motorcycle tours in the trans-Himalayan region are becoming very famous as it takes you through the most rugged terrains and the remotest of areas. 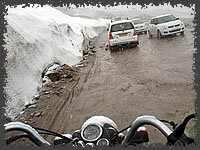 The Himalayas are always a challenge for the riders and one of the most fascinating modes of traveling. Manali – Jispa – Sarchu – Leh ( Nubra-Pangong-Lamayuru). 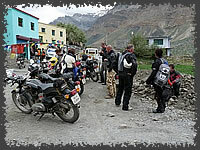 For motorcycle tours we use Royal Enfield 350cc and 500cc. Pulsars are also available for the tour. DAY 01: Chandigarh – Manali (310 km) 8-9 hours. DAY 03: Manali – Jispa (137 km) 6-7 hours. DAY 04: Jispa – Sarchu (83 km) 4 hours. DAY 05: Sarchu – Leh (253 km) 9 hours. DAY 07: Leh – Lamayuru – Alchi (160 km) 5 hours. DAY 08: Alchi – Likir – Leh …Return back to Leh and visit Leh Palace & Shanti Stupa after your return. DAY 09: Leh – Khardongla – Leh (39 km).. Today you will drive to the highest motor able road in the world and return back to Leh. Afternoon at Leisure. 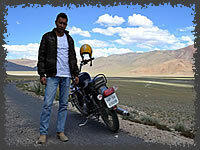 DAY 10: Leh – Pangong – Leh (160 km, one way) 4-5 hours. You will be visiting the highest salt lake in Asia . 1/3 rd of this lake is in India and the rest is in Tibet , total length is around 130 km. Return to Leh in the same day coz the accommodation in Pangong is high. DAY 11: Leh-Shey-Thiksey-Hemis-Leh (one day easy tour of famous monasteries around Leh in the radius of 35km). DAY 12: Leh-Jispa (336 km) you can cover this distance in one day. DAY 13: Jispa- Manali: (137 km). Today you will be crossing the Rohtang Pass again and arrive Manali in evening. DAY 14: Manali..Full day at leisure or you can do sightseeing in Manali. DAY 15: Manali – Chandigarh..Drive back to Chandigarh. © Copyright 2019 Jispa Journeys.